I would like to know what properties within the city limits of Asheville North Carolina have been purchased by Duke Energy Progress over the past 8 years. i would imagine this information is in the Register of Deeds office. thank you very much. I can't believe an organization like this exists! BTW I was not able to enter start and end dates on the form...not sure why...but the start date would be today (April 11th) and the end date would be June 15th. Thank you for contacting the Register of Deeds Office. 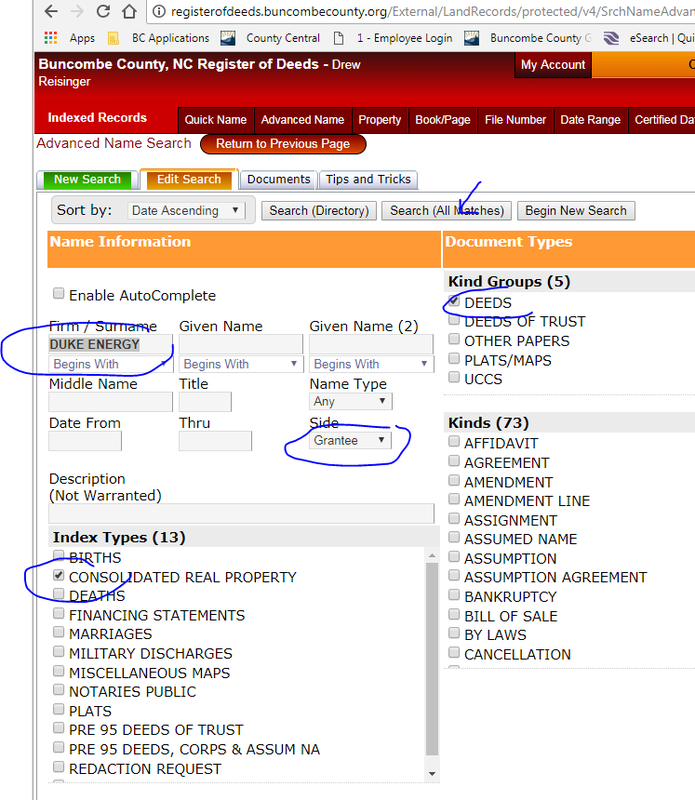 In order to search for Deeds showing Duke Energy acquiring real estate, you can use the search criteria as shown below. The more criteria you select, the more narrow your search becomes. Anything recorded under CONSOLIDATED REAL PROPERTY was recorded in 1995 and after, which would include the last 8 years. Once you get your list, click on the icons to view, print or save images. Please let me know if you require further assistance accessing the public record. thank you very much. I can’t believe an organization like this exists! We used the online look up on Register of Deeds, but what we are wondering is what is the type of document we are looking for here, is it A. purchases made by Duke in the past 8 years or B. all property currently owned by Duke – any tips on how to query the system on how to get this information? When we look it up we see a ton of easements and right aways. Please call me at 828-250-4320 and I will guide you through the process. I understand those documents are available online, I just wasn’t sure if your office assisted with fulfilling records requests directly. I’ll see if I can find the requested information using the online portal – can you point me in the right direction regarding how I should perform that search? Sunshine Request is a community project, so we don’t charge anything to fulfill the requests. I live in Asheville and run a web development company – I’m a big advocate for government transparency and open data, so I built the site to make it easier for other citizens to make requests. By the way – I love everything your office has done to make it easier to access information online! I did take a look at your website and it seems to be a very intriguing idea. I am curious to know if you charge for the services provided on your website. Access is provided to our website free of charge, we do not charge for simple searches and are happy to send pdf’s of documents to the general public. We also provide a Public Search room for folks to perform searches at our 205 College Street location. Use Search Options at top to select search by Quick Name, Advanced Name, Book/Page or date range. Limited Property Search is also available. Click either’ Search (Directory)’ or ‘Search (All Matches) to perform a search. Clicking ‘Begin New Search’ simply clears the search criteria you entered. on the right hand side under ‘Images’ column. While in the document viewer, you have different print options using the tools in viewer screen. To download documents as images or PDFs, use the gray buttons at top of the page. If you need any further guidance at all using our ONLINE RECORD LOOKUP, please let me know. I will be happy to guide you in searching for the Dukerecords request received on your website. The City of Asheville does not have this information. 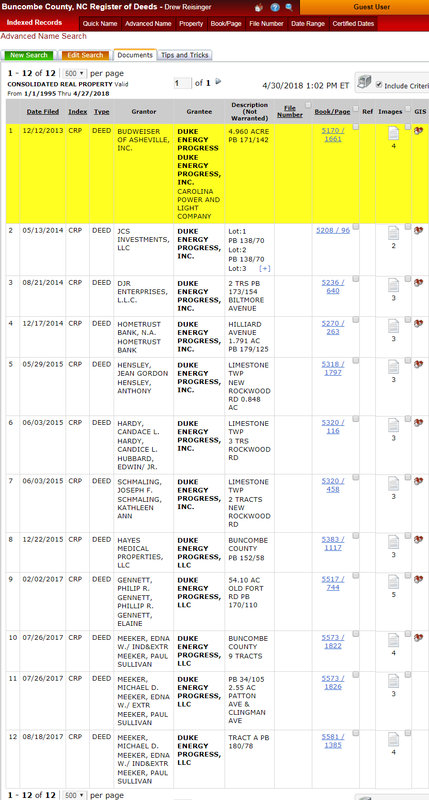 You may need to search with the Buncombe County Register of Deeds. We only maintain information regarding city-owned property. Hi Buncombe County Register of Deeds! My name is Patrick Conant, and I built a site that makes it easier to request public information called “Sunshine Request.” If you have any questions about the project, please send me an email back. BTW I was not able to enter start and end dates on the form…not sure why…but the start date would be today (April 11th) and the end date would be June 15th.